This sample vessel is not modeled after a real vessel. It is a collection of difficult design features and seldom used code requirements: large nozzles, swing bolt covers, cone discontinuities, use of bar stock for nozzles (code case 2148) and the use of sanitary ferrules in vessels. Refer to the calculation sets for more details. The swing bolt cover is analyzed as an appendix 2 flange. The bolt circle is outside of the flange, which is a length of increased wall thickness pipe. The bolt loads try to twist the pipe inside out – the Appendix 2 calculations check for this. Additional calculations are run for the attachment lug weld and shear pin stress. 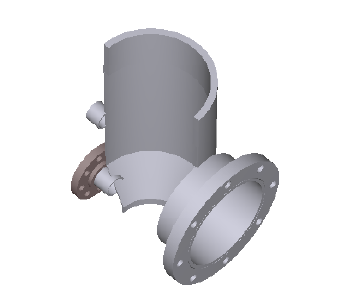 Flange C is also a custom flange calculated to Appendix 2. Ferrules and sanitary connections can not be calculated by the rules provided by Appendix 24 which requires metal to metal contact outside the gasket. Typically, ferrules need to be proof tested, or calculated by Finite Element Analysis. For this vessel, the manufacturer of the 2″ ferrule has provided a CRN number covering the design. The CRN implies that either proof testing or some other calculation method was used to prove the design. The 8″ ferrule does not have a CRN, here a proof test is specified. The side nozzle C is checked against the rules of Appendix 1-7 because it is larger than 1/2 of the vessel body diameter. The rules of Appendix 1-7 can be confusing and difficult to interpret, so in this case, all the conditions regarding moments of inertia and area replacement have been applied. The rules that allow the use of bar stock in pressure vessel bodies or nozzles have been changing. At the time this sample was made, bar stock could only be used with code case 2148. This code case has since been annuled and later reinstated as 2148-1. See UG-14 and App 2-2(d) for up to date information on the use of bar stock in pressure vessels. Example calculation sets using Advanced Pressure Vessel (APV, renamed to DesignCalcs) and PVEng Spreadsheets can be downloaded from the links below.